It’s not “All the Pope’s Men,” but Spotlight illuminates the steno pads and shoe leather worn for the sake of authentic investigative journalism. Here it’s by The Boston Globe's ‘Spotlight’ team, the oldest continuously operating newspaper investigative unit in the United States, and their research into decades of sexual abuse of children by Roman Catholic priests in Massachusetts and an ongoing cover-up by the Boston Archdiocese. The series articles on the scandal earned the Globe a 2003 Pulitzer Prize. Spotlight—and Spotlight’s exploration—begins with the arrival of new editor Marty Baron (Liev Schreiber) in mid-2001. A passing column about abuse complaints against local parish priest John Geoghan prompts Baron to task Spotlight, led by Robby Robinson (Michael Keaton), with taking a deeper look into years of similar abuse reports. What unfurls is an old-fashioned procedural, as Robinson and his three-reporter team— Sacha Pfeiffer (Rachel McAdams), Michael Rezendes (Mark Ruffalo) and Matt Carroll (Brian d'Arcy James)—fan out in search of victims and lawyers yearning to tell their story, as well as politicians and priests with hidden secrets. Pfeiffer and Robinson harangue attorneys involved in dozens of quiet out-of-court settlements. Rezendes attempts to track down victims and other damning sealed documents through Mitchell Garabedian (Stanley Tucci), an eccentric local attorney representing hundreds of alleged victims. At each stop, the journalists encounter resistance, some motivated by fear of a powerful Church at the heart of every civic and cultural aspect of Boston, and some by past furtive failings inside the Globe itself. Writer-director Tom McCarthy gives voice to some of those preyed upon for decades by Catholic priests without grandstanding. The horror of these crimes is self-apparent—the film eschews salaciousness or anything that detracts from the methodical manner in which the Spotlight team unearths the abuse and its concealment. The ensemble cast succeeds mainly as a whole. Of the few moments set aside for individual performances, the standout is Ruffalo, who is outstanding in his idiosyncratic portrayal of the dogged Rezendes and his path from eager investigator to indignant crusader. Where Spotlight falters is not fleshing out the overarching power of the Catholic Church in Boston and the means to maintaining secrecy. We hear lots of appeals to piety and Old Boys’ collegiality, but we never feel the fear that kept so many victims quiet for so long, and preserved a culture of secrecy at the highest levels of Boston government and society. Contrast that with All the President’s Men, where the palpable pall of reprisal seeps through the screen. 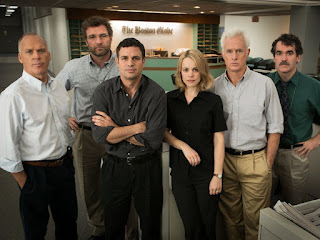 Still, Spotlight also ends with a resignation, and it gingerly positions Globe deputy editor Ben Bradlee Jr., son of the famed Washington Post editor at the center of the Watergate investigation, as a picture of journalistic recalcitrance. In 1994, Keaton starred in The Paper, a film about a day in the life of a bustling New York City tabloid. Spotlight takes place against the backdrop of the transition between declining traditional print press and the rise of online media. In that respect, the film is not only a celebration of intrepid journalism, but also an elegy for a fading medium.